You will have the opportunity to see you kid a lot quicker than you think thanks to the first parent weekend. Most colleges have their parent weekend coincide with homecoming. It’s a very busy time for local hotels and car rental agencies. It’s a good idea to book ahead even as you’re returning home from that first drop-off. Thanksgiving will be the first weekend that your college kid might be coming home. It might make sense to book your flights early to lock in a good price and a good time. Although you want them home early, you might find that actually flying on Thanksgiving morning will give you more options. Your college kid is going to look forward to your care packages. That includes a lot of incidentals that you’re used to buying them along with all their favorite cookie treats. Just remember that they’ll probably be sharing with their dorm mates which means you should double up the batches! You are probably very busy all throughout the summer leading up to the moment when you drop your kid off at college. Now is the time to reconnect with your spouse. Plan a date night that will have special meaning for both of you. Don’t just go to the movies but instead go to a nice restaurant where you can talk and reconnect. 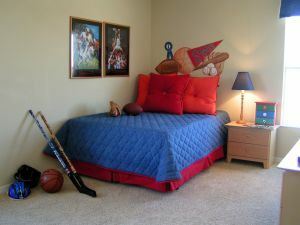 You don’t need to transform your college kid’s bedroom just yet. They still might be coming home for the summers. But there could be plenty of unwanted rubbish you can toss out not only from their bedroom but also throughout the rest of the house. A thorough basement and attic cleaning is a great project to take on and you’ll be helped by hiring a company like Junk King Columbus. Junk King Columbus will dispatch a pair of strong movers and a big truck to your home for the junk removal task. Your only job is to literally point to all the things you want taken away. After your kid goes to college, get rid of rubbish the fast and affordable way by turning it over to Junk King Columbus. This entry was posted in columbus junk removal and tagged clutter, college, rubbish on August 27, 2017 by Junk King. Last updated August 27, 2017 .